Witch hazels are blooming right now and filling the air with their sweet vanilla fragrance whenever the sun warms up the garden. 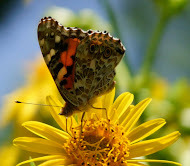 It's no accident that most winter blooming plants have some fragrance...Nature had to insure that insect pollinators could easily find their way to a plant that blooms when most of the garden is fast asleep. Those lucky enough to catch a pollinator visiting in the deep of winter describe seeing small flies and gnats...perhaps even hoverflies. 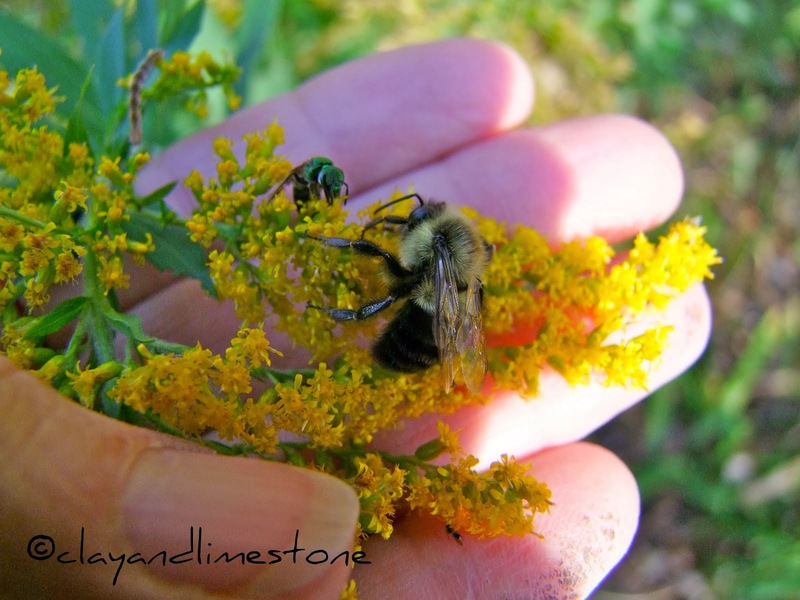 Just last week when the temperature reached 60° there were honeybees nectaring on the flowers. But, our Wildflower Wednesday star of the month, Crossvine/Bignonia capreolata is not blooming and won't be for several months. It doesn't matter, it still has much to show for itself~ the evergreen leaves take on a reddish, even a deep burgundy hue in cold weather that's quit attractive in a mostly brown winter garden. Bignonia capreolata is a vigorous, vine that climbs by branched tendrils and has attractive trumpet shaped flowers in early spring and summer. the cultivar 'Tangerine beauty' is a beauty! Hummingbirds prefer trumpet shaped flowers that are rich in nectar and Crossvine flowers fits the bill! The species is a lovely red and yellow trumpet bloom. It's native to my garden and I planted the cultivar 'Tangerine Beauty'. The Crossvine blooms are very like Trumpet Creeper/Campsis radicans, both are Bignoniaceae family members and both bloom early, just in time for returning Hummingbirds, but, you'll find that Crossvine is the better behaved vine. Plant it where you can see the blooms and the hummingbirds. you can plant it to climb a wall like Cindy Tournier/My Corner of Katy has done at her house. In my neck of the woods, it is more often seen scrambling 30 to 50 feet up the trunk of a canopy tree on its way to the top and sunshine. You might not notice it during the summer, it has deep green leaves that get lost, but, if you see a trumpet shaped flower lying on a path~stop and look up. The flowers will be blooming at the top of the tree. Right now is a good time for you to spot the reddish leaves and vines. They're native to the Central and Southeastern US, so walkers and hikers be on the lookout and make a note where to find them early next summer! It tolerates a wide variety of growing conditions, but prefers an organically rich, well-drained soil in full sun (what doesn't). Trust me, if I can grow this beauty in my shady conditions, you can, too. If you're concerned about its vigorous growth, you can prune it in the spring after it blooms to control the size and shape. 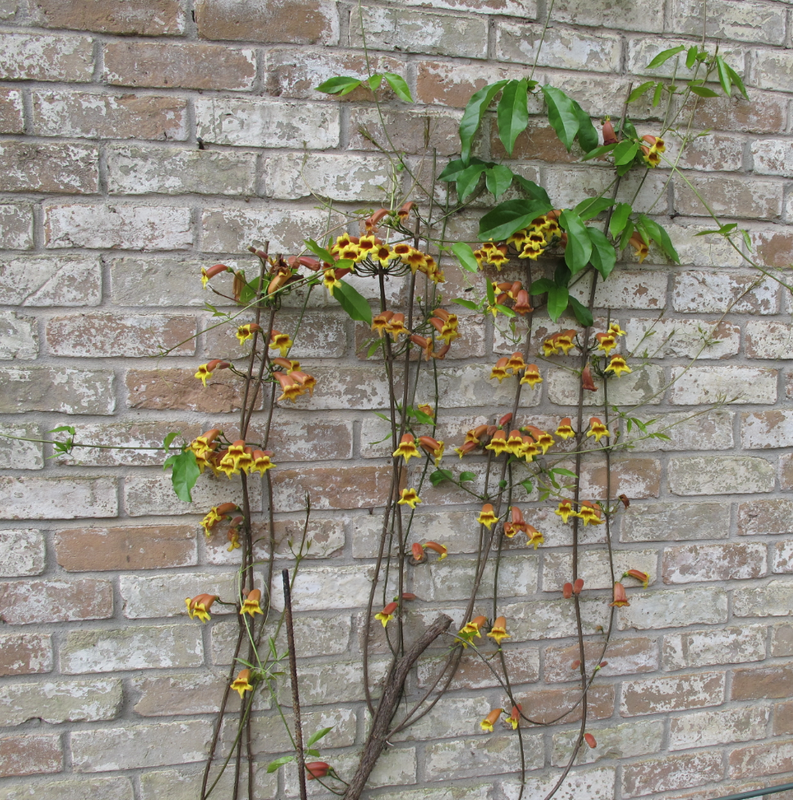 I think Crossvine is the perfect early flowering native for anyone who gardens for wildlife....and it's good looking all winter! 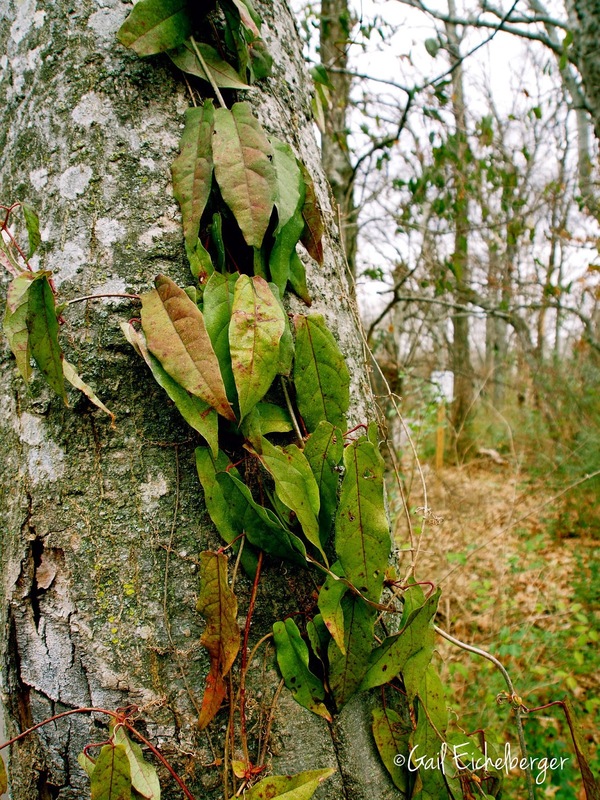 Type: vigorous, woody vine that climbs by branched tendrils with adhesive disks. Tolerates: Heavy Shade, will climb up canopy trees and shrubs to reach the sun. 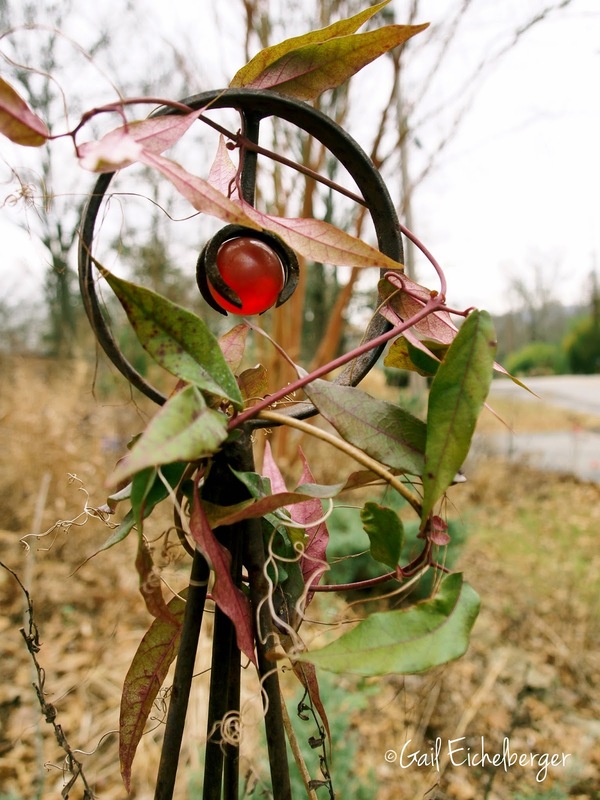 When I lived in North Carolina, there was a big mass of Crossvine in the woods along the road near a grocery store. I always enjoyed seeing it in bloom. Very pretty! I'm considering a couple vines to grow up trees around my yard, and this is one of them on the list of possibilities. I've been enjoying the photos and posts by British bloggers about witch hazel--I love those blooms. Interestingly, I've grown a Crossvine for about 17 years and just yesterday, pruned the dead twines--I suppose it's just played itself out. But it's a fabulous vine and I'd certainly recommend it. I pulled off some bits of vine and root a couple of years ago when I noticed the mother plant was declining and moved it to another spot and it had blooms last spring. Thanks for hosting this great meme for all things wildflower! My witch hazel isnt blooming right now. I have tried to get crossvine started here. My DB pulled it thinking it was a weed! I replanted. I will have to wait until spring to see if it survived. I think it is so beautiful when it blooms.Hummingbirds love it as well as the bees. following my nose, I found tiny white flowers on my fiddlewood tree. A great reminder as I need to look for this vine....I am not sure if and when my witch hazel will bloom...I hope this year. I'll be on the look-out for this vine here. Hi Gail, I have seen witch hazel, but I don't think I've seen that vine. It's quite impressive! I am in the process of writing a post. I'll link it when I get it done. Really? Zone 5? Well, I can give this one a try then. Beautiful photos Gail. I think we have crossvine down by the creek. We used to have it near the drive but it was destroyed during the house move. It's a beautiful vine -- and really does climb very high into the trees! 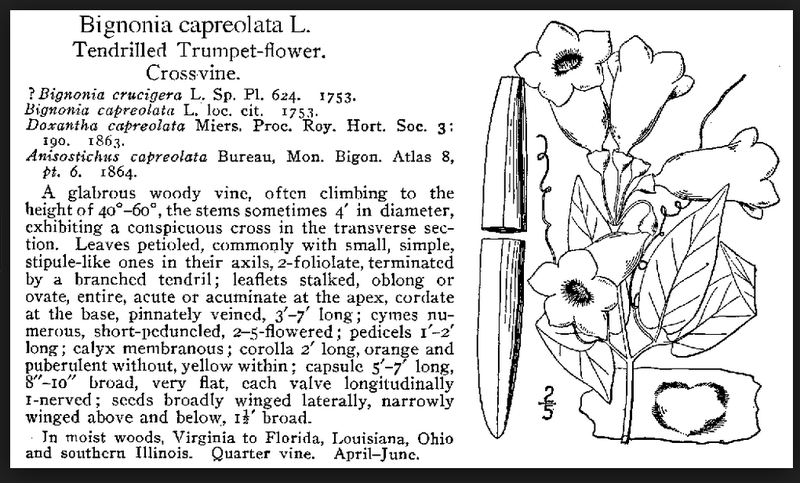 I think I'm just a tad too far north for the Crossvine, but I do remember seeing it further south in Illinois and at some botanical gardens I've visited. Although, I see that you mentioned above it's hardy to zone 5. Maybe I could try it in a protected area. I do have some interesting microclimates on this property. Beautiful plant! I love crossvine. It grows wild here and the first time I saw it was in the Dismal Swamp. Some of the beautiful flowers had fallen to the forest floor, and I had to figure out what plant they were coming from. I didn't even know its name back then. Now I have my own. Hi Gail, how have you been. I love your Tangerine Beauty. I will research to see if it is hardy in my area but I seriously doubt it. I would love to have one twining up the birdhouse post.